Come up with any good New Year’s resolutions yet? Here’s a thought: if you’ve ever committed one of the six cold email sins below, avoid repeating those mistakes in the future. These email personalities showcase a variety of problems—self-obsession, laziness, ridiculously long messages—but they have one thing in common. They do nothing to make the reader feel valued. Making a recipient feel like 1 of 1,000 is a surefire way to turn them off. Sometimes, this is unintentional, like forgetting to personalize a message. Other times, it’s blatant and obnoxious, such as outlining your thoughts on random topics that have nothing to do with the sender’s business. And sometimes, pointless formatting is to blame. Whatever the reason, these messages are perfect examples of how lack of focus on the sender will ruin an email. Without further ado, here are our latest Hall of Shame personas to avoid. There are a bunch of issues with this email (copy errors, features instead of benefits), but what really stands out is its overly general, infomercial-like quality. Meanwhile, the intended market here is more general than a TV audience from the 1990s. 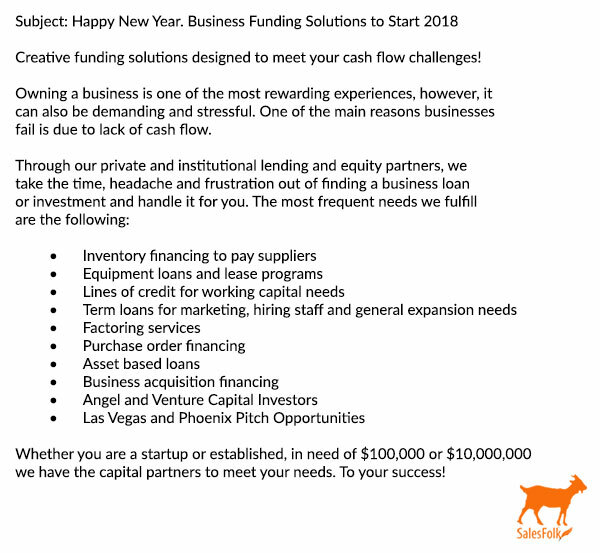 The email assumes pretty much any business has cashflow problems, then offers a list of features that address substantially different financial needs. Extra-general sentences and information is perfect when you’re Mad Libbing around the Christmas tree with family. 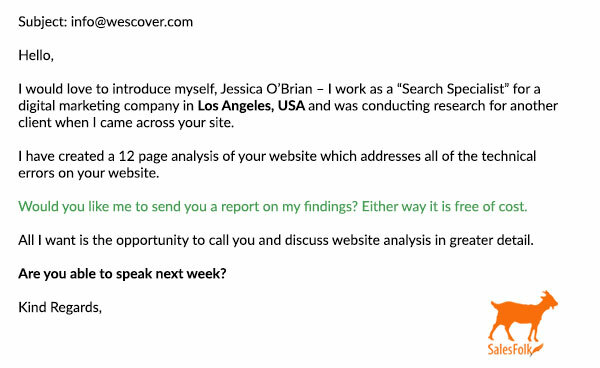 When it comes to cold email, it’s a one-way ticket to the trash. 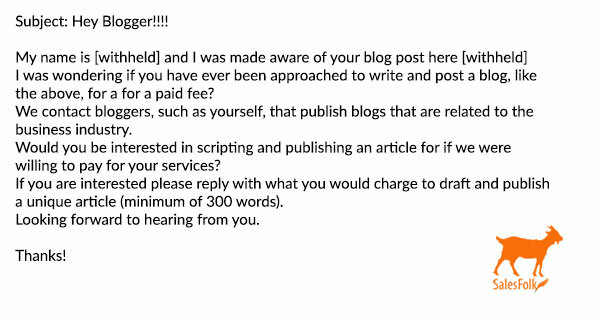 This email is all about asking me for things without revealing anything about who the sender is, what they do, or where my proposed article would eventually wind up. The vagueness doesn’t stop there, though. “I was made aware of your blog post here” only directs me to a website of marketing links and no mention of SalesFolk anywhere. Then there’s “ . . . publish blogs that are related to the business industry.” Business is not an industry, technically. Even if you bent that rule, you’d still be left wondering which aspect of business this sender is referring to. Sales? Writing? Shoe manufacturing? Personal pet peeve: the sentence length here is almost perfectly uniform, which suggests Siri actually wrote this email. If you want to keep your reader’s attention, vary sentence length to keep the flow natural. Under no circumstances should you ever kick off a cold email by joking about a religious figure. And that’s the lightest of this email’s crimes. More concerning is the complete mess that makes up the rest of the copy. There’s no consistent punctuation to speak of, only a jumble of commas and colons. Lines like “No, we are not trying to sell anything, no we don’t have any other schemes up our sleeves, please bear with me 1 more second of your time” make me think the sender did a brain dump straight into the email and never followed it with a proofread. Speaking of “no schemes up our sleeves,” this entire email is a scheme, just a badly masked one. It’s totally trying to push something on me (getting my feedback), despite claims to the contrary. Though, honestly, I don’t think this person meant to be deceptive. This email is more a case of disorganized thoughts, poor copy, and too many ideas packed into a single message. 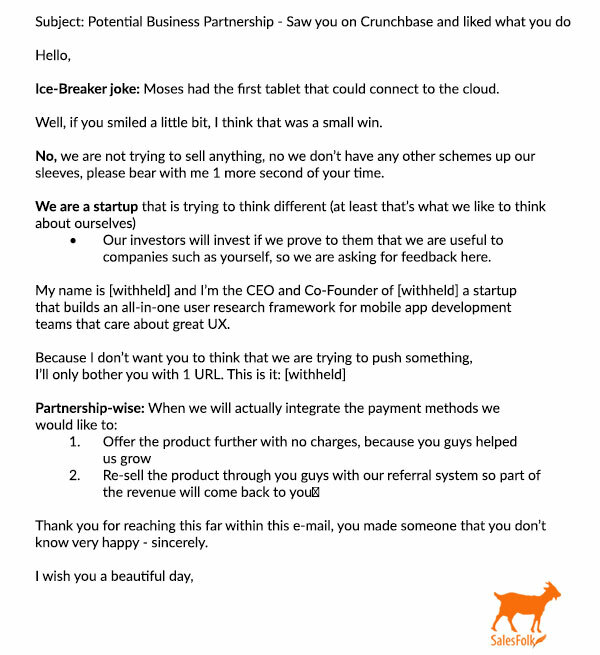 The Pretender is a cousin to The Slacker—they never put much effort into their cold emails. But unlike their cousin, who doesn’t care what you think, The Pretender really wants you to believe they’ve gone above and beyond for you. Like most pretenders, this one doesn’t do a very good job of masking their laziness. The message is full of empty, obvious information (“I would love to introduce myself”). The subject line speaks for itself in terms of quality. And the message also promises me a list of technical errors on my site, but gives no clues as to what those errors might be. I’m inclined to believe the 12-page doc promised doesn’t actually exist yet, and that it’s mentioned in the email because that sounds nice. In cold email, where you have seconds to capture a person’s attention, every single word counts. Set aside time for checking your work—often more than once—before you send it out. When someone’s too lazy to take those steps, it usually shows. PS: What’s with the green line of text in the middle? This email should be about a quarter of the length it is currently. But when you spend a bunch of time talking about yourself, the words are bound to pile up. The only parts of this email acknowledging my existence is that the sender came across us and that we’re invited pay a lot of money to test out their service. 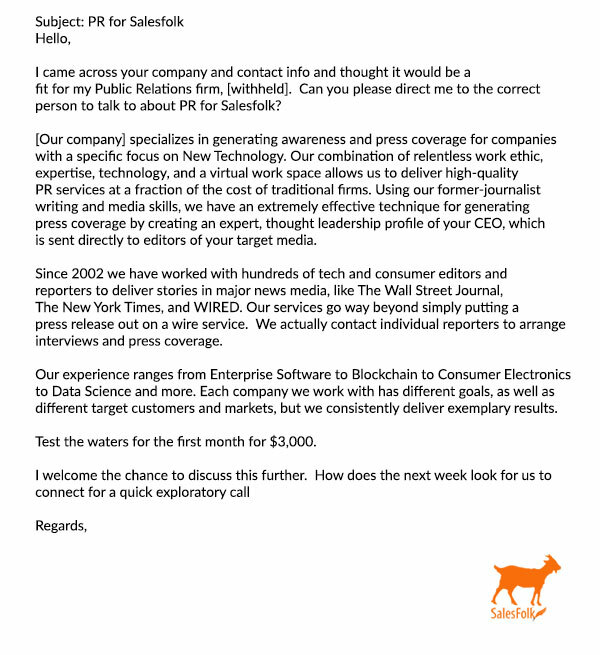 I can buy a farming robot for my backyard for $3,000; why would I spend that money on someone who doesn’t take the time to ask me why I might need their PR services? It’s great that this particular company has gotten accolades from some high-profile publications. That isn’t the same thing as including good social proof, which, in cold email, uses past success stories and stats to entice the potential customer. Listing NYT and Wired in this context only makes the email sound more self-obsessed, and is as empty as telling someone you came across their company. Part of the trouble here is the email’s length: it’s the digital equivalent of the guy at the party who won’t stop talking about himself. But even half as long, this message would still come off as obnoxious and self obsessed. Because like the guy at the party, who will talk about anything just to hear the sound of his own voice, this sender strings a bunch of unrelated topics into an email without any apparent purpose. 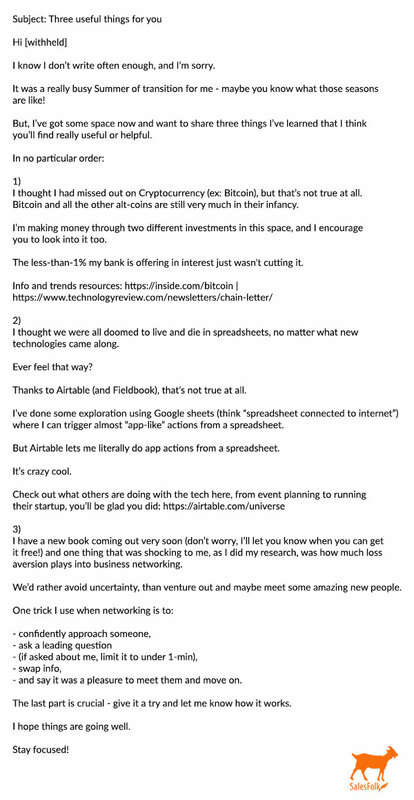 What do cryptocurrencies, digital spreadsheets, and a forthcoming book have in common? I don’t know, based on this email. Finally, the email ends with “networking advice” and an instruction to “stay focused.” You’ve heard the mantra practice what you preach? Clearly, this person didn’t.